Next to roasting marshmallows over a camping fire and fishing in the lake, it’s kind of hard to imagine a more iconic summer-time outdoor activity than hiking. You know it’s good for you, and reaching your destination on top of the summit and enjoying the view is a reward in itself. But there are many more benefits you could get out of hiking, health benefits in particular. Moreover, in order to participate, you don’t need more than a water bottle, and a quality pair of boots for hiking. You can buy bottled water to take with you on the trip, but you can’t just take any pair of boots you already own. Buying boots for hiking is not that simple. Everyone has differently shaped feet, so a pair that might fit well to one person won’t necessarily be comfortable for another. However, with the wide array of available choices, you might find yourself in a need for some help to narrow down the options, so you don’t sit in front of the computer for hours and end up browsing through all the available shoes. Here are a few steps on how to narrow down the possible choices. First of all, decide whether the majority of your hikes will be short or long. For short day hikes, low and mid cut shoes are better, making you hike faster and lighter. They can be used for longer hikes as well but at the end of the day, they’ll lack the support and will not last you as long as the high cut boots. High cut hiking boots on the other hand, provide much more support around the ankle and are generally made of heavier fabrics like leather. These will also keep you warm through the night, so they are definitely better suited for night hikes. Next, eliminate any style that doesn’t fit the shape of your feet. A shoe that fits you well should wrap itself around your foot, so if you have wide or narrow feet, look for styles and designs that will accommodate them right. Foot volume also needs to be considered, as well as any problems you may have had with your feet. 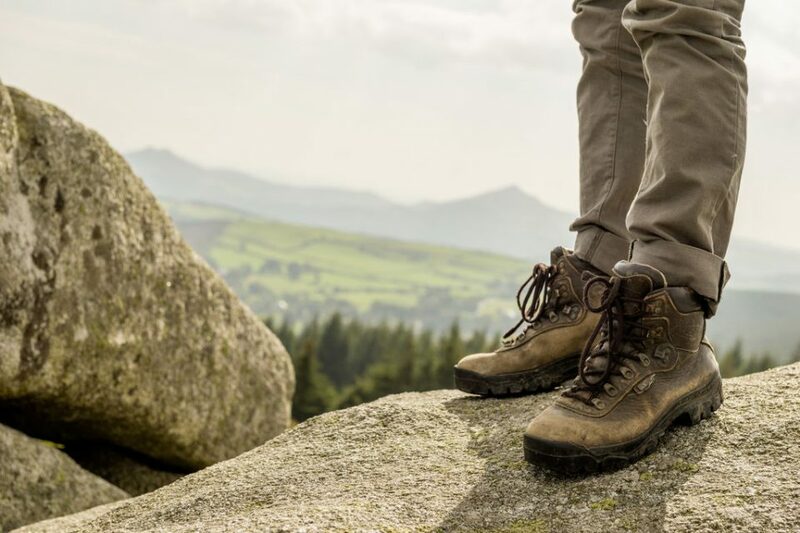 Don’t pay much attention to numbers – as the shoes you wear for everyday use may not be the best indicator for hiking shoes. A lot of people, including myself, have uneven feet, so always put on the shoe on your bigger foot. And lastly, if you have the chance, walk around a bit with them to ensure they are comfortable. The last thing you want is pain in the feet midway through your hike.